(Lanka e News -16.Dec.2018, 9.00PM) It is a pleasure to me to address you once again as the Prime Minister of Sri Lanka. You all know that the basic law of our country is the Constitution. Now we have passed 87 years after we gained franchise. During this whole period the people of this country protected the Constitution. They protected fundamental rights. Whenever there was a threat to the constitution and to the fundamental rights, they came forward to protect them. Same thing happened in the Presidential Election in 2016. You all joined hands to end an era in which the Constitution and the rights of the people were suppressed. It is with this intention that we adopted the 19th Amendment to the Constitution in order to protect the rights of the people more and more. I would like to emphasize that democracy will not be strengthened by acting against the constitution. The Prime Minister of the Country should have the maximum confidence of the Parliament. Without a majority support a Prime Minister cannot bring forward the Country. Similarly, the Prime Minister and the Ministers should vacate their posts when a no confidence motion was passed in Parliament against them. In terms of the Constitution no one has the power to dissolve Parliament until four and half years have lapsed after a Parliament is formed. It can only be done on a resolution passed by two thirds majority in Parliament. This Constitutional violation cannot be rectified by way of an election. It is also stated in the Judgement of the Supreme Court. I would like to quote the following paragraph included in page 85 of the judgement delivered by the Supreme Court. I said the same thing on 26th October at Temple Trees. I said that our fight was for the sake of democracy, justice, protection of the Constitution, adherence of the rule of the law and civilized and moral conduct of society. I also said that we would win this fight. Even today I am telling the same thing. I will tell the same tomorrow too. I will abide my word. I will do what I say. I say only what I can do. Most of the people of this country joined together to protect the constitution, democracy, and the rights of the people. Hundred thousand of people who adhere to their conscience came to the forefront of this fight as Sri Lankans, disregarding their race, religion and party politics. Sri Lankans living abroad too supported this move to the best of their ability. They joined this fight on behalf of their country and democracy without any personal gain. I take this opportunity to salute them all. Similarly, I would like to pay my homage to the Maha Sanga and the clergy of other religions who guided us in this endeavor. The Hon. Speaker, Ministers and the members of the Parliament fully dedicated to uphold the supremacy of the Parliament and democracy. I offer my sincere gratitude to all them. Our judicial institutions including the supreme Court and the Court of Appeal exhibited their independence and the identity to the whole world. I would like to extend my gratitude to the Judiciary as well as to the lawyers who made their legal submissions. And also, I offer my gratitude to the members of the public service, armed services and the Police who upheld the rule of law and justice. My gratitude should go to the journalists who fought for the impartiality of Media in the midst of the pressures of errant journalists and to all who toil day and night voluntary to tell the truth to the World through the Social Media. In January 2015 and August 2015, we gained the mandate of the people to bring about good governance, to preserve the democracy and the Rule of the Law to eliminate frauds and corruptions, to empower Parliament after abolishing the executive presidency and to uphold the sovereignty of the people. During the past three and half years we have done a lot to the Country. It is due to progressive steps including the establishment of the independent Commissions that many institutions including the Judiciary could act independently. The whole country is enjoying the harvest of the seeds we sawed during the past three and half years. We are happy about that. However, there are things we could not implement in this period. Some work got delayed. We could not finalize some work. But we haven’t lost our dedication determination. We are determined to rectify our shortcomings. We will take the steps to expedite the litigation regarding frauds and corruptions. We have created an environment in which different ethnic groups can live together in harmony and co existence. We will dedicate ourselves to maintain harmony among different ethnic groups. Now, we should go forward. Even by now, we have initiated the discussions with a number of political parties in respect to abolishing the executive Presidency. 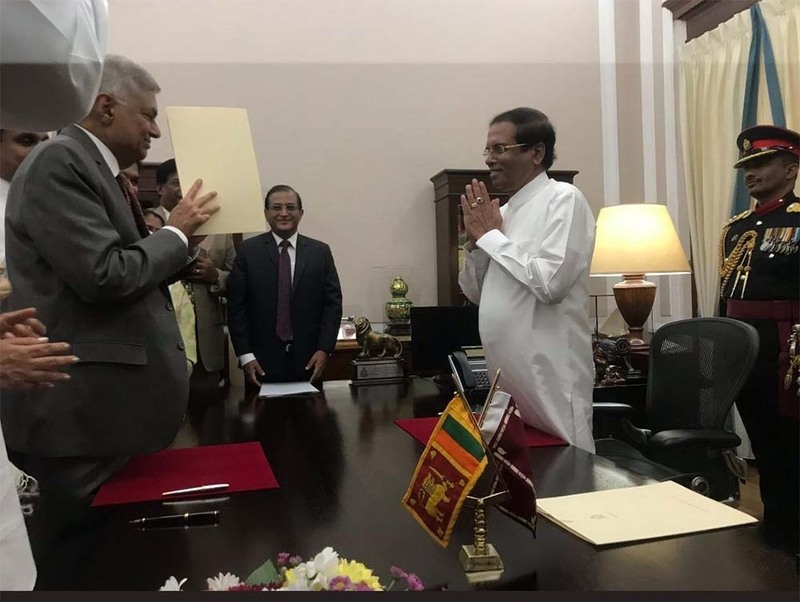 And also, we will have discussions with the Tamil National Alliance and Janatha Vimukthi Peramuna to bring about a political solution in which all citizens can live in harmony in a unitary state. I didn’t take any steps to enter into any agreement with the LTTE in order to win the Presidential Election. In the past I dedicated the victory in the Presidential Election for the sake of my motherland. I haven’t yet changed that stand. Our intention is to form a broad alliance to protect democracy. It is only through democratic environment in which the voice of the people is considered and the rights of the people are protected. We can bring about a dignified society where future generation can do without fear. Our effort is to create a strong democratic environment that any external force cannot suppress. My heart-felt wish is to create a such a Sri Lanka. You all wish for such a country. It is the hope of all Sri Lankans. Therefore, I appeal to all of you to forget all differences and join hands with this broad alliance, for the sake of our motherland, democracy rights of the people and to bring about a free country for the unborn generation. Let us allow our heart-felt wish.